Artist, writer, and radio host ILJA KARILAMPI is a storyteller in the age of fiber optic communication. Drawing references from Dutch stadium house, American hip hop, and his own experiences as a Swedish native based in Berlin, Karilampi’s works are circuitous, sticker-littered networks of symbols. 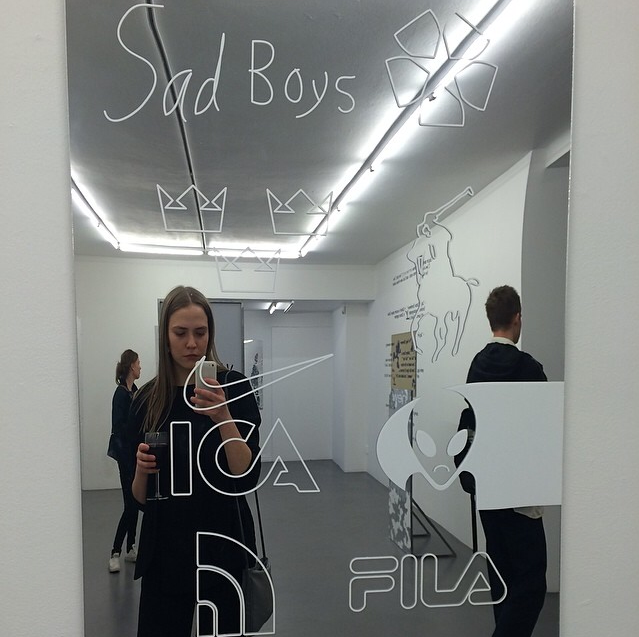 They reflect on the adhesive identities formed by logo-mania and newsfeed culture. With previous projects ranging from a video on the shared history of Dr. Dre and Le Corbusier, to decal-covered selfie mirrors, Karilampi’s investigations and meta-histories make their home in a heterotopic air space somewhere above the Atlantic Ocean. During his Tocqueville-esque journey to the hometown of 50 Cent, Karilampi sent 032c a VIP tour of his upcoming solo exhibition Xxxercise at Suzanne Geiss Company. Xxxercise is a continuous tone, like the London radio station Rinse.fm, or a plainclothes cop working the field, sleepless from solving a case of unorthodox character. Riffing on decades of VIP lifestyle and the sculptural club life of New York since the 70s, Xxxcercise is a purgatory space; an aesthetic environment trapped between studio and nightclub. It is an exhibition without a start and a stop — both an artwork and the site from which it emerges. A screen shot of a table in the VIP room that the local crew built for 50 Cent & G-Unit when they performed in Sundsvall, Sweden. The cleaning ladies pimped up an old dressing room in the arena, with some custom text and candles to make the rappers feel comfortable. Unfortunately neither 50 nor his crew ever saw the VIP room, since they left directly after the concert. This is some drawn notes to catch those first ideas while brainstorming for the show. It´s from my room in the highrise on Ritterstrasse in Berlin; Dutch teenage stadium house music producer Martin Garrix, the London radio station RINSE.FM; all these producers and set-ups I wanted Xxxercise to riff on. A photograph my little brother Sascha Karilampi took of me and the ever-inspiring Yngve Holen where we are listening to Lil Durk outside a gas station in Kreuzberg in Berlin. A flavour of Four Loko I hadn´t tried yet. I drank it on the LIRR train back from a day of sailing in Plandome with Alexander Kellogg, really inspired by the americaine aestethics. The backside view of three posters printed for the show, wheat pasted to the windows facing 76 Grand Street. Its really important that some elements of the show can afford themselves to be attached directly to a surface. Nhu Duong spotted on the sidewalk. This one turned out very Berlin in the end. Combining tabloid BZ´s logo, a Lil B concert poster graphic, and a selfie taken somewhere around Havelersee, the motifs are laser cut into plexi and screwed to a custom made aluminium frame. The latest radio show for Berlin Community Radio that we did, and which also will be played throughout the exhibition when I´m gone, is called #CIROGFROGZ. Ribbit. Guest and artist Dora Budor attaching a nigerian__queen sticker on the floor, wearing a found UA cap from the bar a few nights before. Also hear her as “Katy Perry” on the Downtown Ilja Chinatown Special. Me and Lucas Mascatello, who has been the one from the gallery side working with me on the whole Xxxercise, laying out the big fence piece. Lucas is a young, very organized, artist. There´s always tons of stuff around during installation. I don´t know what the #%& Jim Jones is up to here but it looks like a pretty classy water moment to me. I didn´t make it to the Hamptons yet, but did hit up Plandome, Manhasset, which was a mind-blowing, subtropical, experience. The first smaller frame I designed. It´s a wordplay on Lil Wayne’s skateboard label Trukfit, but it´s also acknowledging their tour and the sketchy ways of Ticketmaster. It measures 88 x 60 cm and also has self-adhesive vinyl on it. An important troll picture for Xxxercise. Again, Xxxercise really is an exercise in itself — in setting up a VIP room, a studio, an HQ, or a dysfunctional radio studio. Lucas had to spend hours connecting Traktor to our equipment. You also see the treadmill we have gotten installed in the back. Another very important aspect of the exhibition is the custom mini bar. Feel free to grab something; we´ve got sports shakes, beers, and other more suspect beverages. Basically it´s like creating your own rider. A part of the R3HAB GERMANY piece, this one measures about 200 x 140 cm. The heart is where Berlin is at, and the cutout Jaguar logo is where Frankfurt is, a home of mine for four years. A projection of an unreleased music video for rapper Bladee, super-imposed over the drawn schedule in the headquarters. We had a little VIP session playing around with these inverted moving images. It´s been great that fellow Swede, fashion designer Nhu Duong, has been in town as well. This is from a sketch for some kind of photo shoot within Xxxercise, posing in front of the sassy and classy fence piece. A piece for a smaller R3hab Germany frame before getting attached. I think the name R3hab comes from producer Fadil El Ghoul, who has been doing all of these Dutch-style mega house remixes for a bunch of artists, often very ecstatic. The way Americans count their money is very special. They love to handle it. Apropos: before we run out of time: the pop band The Embassy means a lot to me, and I think a lot of artists from Gothenburg in Sweden can relate to their legacy. Karilampi’s exhibition Xxxercise opens at Suzanne Geiss Company in New York on September 4th. Follow Karilampi on Instagram @nigerian__queen.